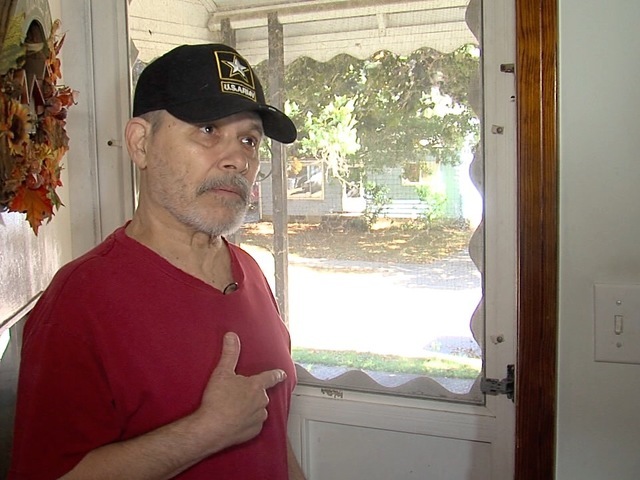 A senior citizen, who is also an Army veteran, took matters into his own hands after a burglar charged into his Akron home. The homeowner wrestled with the intruder and then shot him in the leg. Craig Noggle, 66, is sore from bruises on his lower back and arm after fighting for his life inside his home on Sullivan Avenue. Noggle says his neighbor, Daniel Givens, knocked on his door Sunday morning and walked away. But when Givens returned a second time, the Army veteran sensed something was wrong. That time, he said, he had his gun and a warning at the ready. "You try to come in through this door, I'm gonna shoot you," Noggle said he told his neighbor. "He said, "Yeah, where's the gun?' and I picked it up. I said, 'This is the gun and you're gonna get shot.'" Noggle said the suspect forced open the door anyway. At that point, Noggle, who has survived three strokes and two heart attacks, started wrestling with the suspect on the ground. "I thought, 'I'm an old guy. I got to face up to this. I'm just not going to be able, I don't know if I can take this guy.'" He took multiple punches before getting to his knees with his gun. "I just pulled a weapon, aimed at his leg and fired," Noggle said. Givens was shot in the ankle. Police found him at his home, took him to hospital and then charged with assault and aggravated burglary. He was being held in the Summit County Jail. Noggle said he has had other issues with Givens, including telling him to slow down because there were children in the street and challenging him for peering into the homes of neighbors.